← QPR – now is the time for stability & to stop being run like a ‘Football Manager’ side. I have to say, I absolutely love this website. First off I must be honest, I don’t know how you can watch football and analyse the game so simply. Whenever I watch, I can’t tell tactics besides what is given in the starting lineups. Any ways that’s not the point of this comment, I love the site. I feel as if every post you make, I get just a tad bitter more smarter at the game. I am a novice soccer fan who became a Liverpool supporter recently (Sorry KJ) and truthfully, the success of Euro 08, World Cuo 10, Euro 12, and the 2012 Champions League Semis/Final made me come and appreciate the game at its best. Lately, I’ve been listening to nearly all of the old Footy Shows that I can fine. I miss the show. I miss the days of Dobby, Punners, yourself and James (or as he was called one time Shunners). I miss the days when everyone was part of the Footy Blog. I miss Punners getting ripped for mediocre producing of TYK and supporting different clubs. I miss Dobby dropping Semin References like it was going out of style. It was a family, and now it’s as if everyone has drifted apart. So what’s the point of all this, while maybe this site won’t be what the Footy blog/Footy Show was earlier in my life, I can’t wait for more posts on the tactical side of the beautiful game (when there isn’t diving)! It almost seems like Mancini is flirting with a 5-2-1-2. He wont play with out and out wingers unless they can track back or contribute defensively, and he seems to love having a RDM and LDM in his systems. Do you think Milner will find himself in one of those roles in the future? When Richards comes back im assuming he would play on the far right of Mancini’s formation in a defensive role. This may leave little chances for Milner to play on the far right. He seems to play well enough in the middle of the pitch, and has great range in his passes. If he were to play in one of the deep roles when and if he decides to go for a run, the wing backs could slot into the hole he’d leave behind. I am not sure how often Milner has been used as a wing back this season, but it shows Mancini must think he has defensive quality in some form. As well with Milner in the middle there a chance of him smashing in some balls from outside the box, he doesn’t shoot as much as his Villa days but he is has very impressive technique. . Sorry for the late response – I had my 5th annual charity footy tournament at the end of this week and spent 2 days dealing and running that. I am back and just read your message. I think Milner is very important to this system because he can play centrally and offer Mancini both defensive discipline as well as penetration going forward. 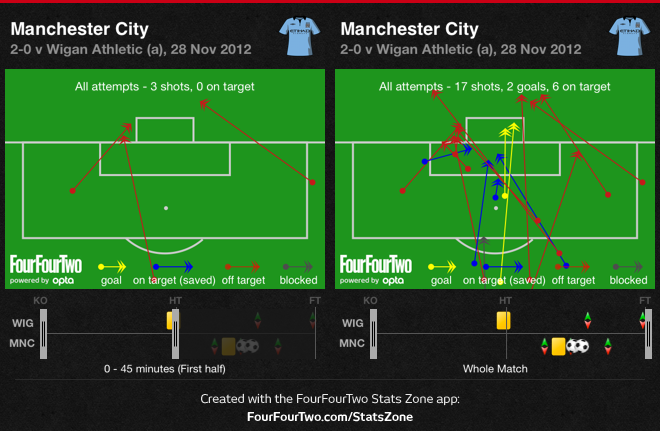 Mancini tried this at WBA but then Milner got sent off – not his fault or the system mind. Very impressed with the work you do, thanks for the response. Can’t wait till Chelsea’s tactics eventually come up! PS. I know all of you are busy guys, but if there was a year end quiz ”the crew” including joe ross, it would definitely make my holiday season. thanks for the kind words – cannot comment on a quiz right now – its TBD.